Tuesday, December 2nd marked the 4th Quarterly Member Meeting of 2014! Thank you to UW-Milwaukee School of Freshwater Sciences for hosting us. It was a pleasure to see many new faces including welcoming two new Water Council staff, Monica Pless, Event Coordinator, and Ashley Janke, Communications Coordinator. For those who were unable to attend, here is a brief recap and a link to the presentation below. Members were able to take a tour of the new School of Freshwater Sciences building, which opened on the one year anniversary of the Global Water Center, September 12, 2014. Attendees viewed many areas of the building while tour guides highlighted labs, teaching facilities, manufacturing areas, and florescent filled hallways. Before concluding, the tour received a breath of fresh as they gazed upon their primary research vessel Neeskay. Meter and Co-Chair of The Water Council, welcomed all guests before introducing UW-Milwaukee Interim Chancellor and Water Council Board Member, Mark Mone, who briefly touched on the unique, innovative qualities of the UW-Milwaukee School of Freshwater Sciences. Vicki Elkin, Fund for Lake Michigan and Joel Brennan, Discovery World, followed Mone to briefly discuss the Sea of Sustainability Lab under construction at Discovery World. Featured Speaker: Mike Turillo, Founder & Chairman of inno360 Inc., introduced the latest version of the Water Collaborative Innovation Platform which first premiered at the 2014 Water Summit. The Platform is a web-based, search, innovation management and analytics tool. Through learning, connecting and sharing, this technology will create a trusted collaborative water ecosystem for industry and academic researchers. “Innovation is not what is created today. It is what is used today. Innovation is in the ‘eyes of the beholder’,” Turillo emphasized as he described how this platform will not only allow a space for the collaboration of new technology, but will allow a new way to find existing information and technology specifically in the water industry. The Platform will place communities working in different arenas in proximity to each other, giving the members a way to understand massive amounts of content through statistics and infographics in order to organize thinking around innovative solutions. In an era of a content saturated world, this is a platform to ‘make sense of it all’. 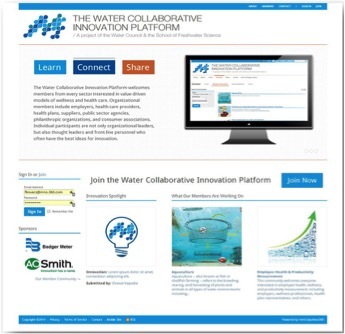 In 2015, Water Council Members will have access to the Water Collaborative Innovation Platform through a subscription based on their degree of membership. The BREW (Business. Research. Entrepreneurship. In Wisconsin.) Accelerator: Elizabeth Thelen, Director of Entrepreneurship & Talent, and Brew II representatives shared and explained their startup missions and goals. On an exciting note, Wellntel is officially launching! Also, WatrHub is looking for a research intern. Contact sunit@watrhub.com for more information. Wetskills Challenge: Eric Doescher from UW-Whitewater’s Institute for Water Business spoke about their Wetskills Water Challenge. The challenge is looking for students to apply from Canada, the Netherlands, and the United States. 20 students will be accepted and sponsored to tackle contemporary water challenges of the world (for more information CLICK HERE). Engineers without Borders: Jesse Nechodom and Marissa Jablenski from Engineers without Borders will be hosting their 7th Annual Benefit at the Global Water Center on February 20th, featuring a silent auction. Proceeds will go to their current mission project designing and building water distribution systems for villages in the Lxill region of Guatemala. Expanding Talent & Education Committee Programming: Committee Co-Chairs Joe Russell, President of Watertech of America and Heather Koehn, Marketing Manager at Pentair discussed the committee’s “K to Gray” initiative. Their goal is to make 100% of K-12 students aware of water business, freshwater problems and solutions and to inspire 1% of them to pursue a career in a water-related field. To build awareness in the youth, they would like anyone involved in the water industry to volunteer 3-4 hours of their time to work with high school students through My Life My Plan. Volunteers will have a chance to meet with 2-4 students and give insights on current water issues. The next My Life My Plan date is December 12th and a February meet up is in the works. For more information, contact Heather Koehn through the Pay it Forward Campaign, or at heather.koehn@pentair.com. Another initiative in the works is a partnership with Junior Achievement’s Biz Town, which will also be opening up a Water Storefront. 120 students access Biz Town per day and it is a great opportunity to expose students to the water industry, and opportunities that exist for them. After the Members meeting closed out, many guests stuck around for a spread of cookies, coffee and conversation. Join us for our Q1 2015 meeting February 18th! If you are interested in hosting please contact Monica Pless, Event Coordinator, at mpless@thewatercouncil.com. For the the PowerPoint Presentation CLICK HERE. This entry was posted in Quarterly Meeting. Bookmark the permalink.